As there’s still no offspring here (*sniff* I miss them, especially as it’s Mother’s Day here in Antwerp – yep, only here, we’re special ), there won’t be any disapproving looks either. I made it in my tajin (best buy ever, seriously!) 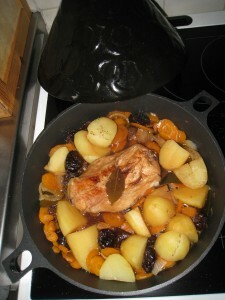 with a surrounding of carrots, onions, prunes, bayleaves and potatoes. No defrosting, just bunged it in with the carrots and onions first, with a generous splash of olive oil. 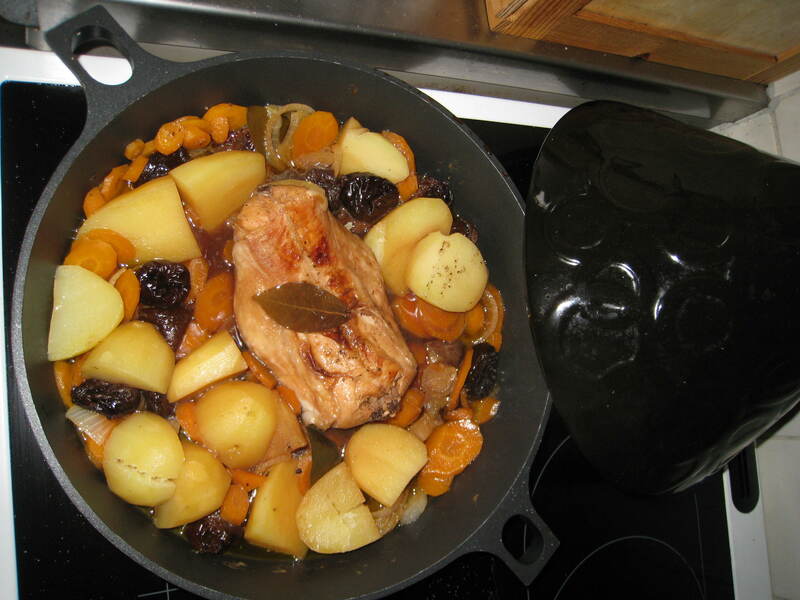 Let it brown, covered on high heat for about 5 minutes, add prunes, bayleaves and the main ingredient, a bottle of brown beer. Grimbergen this time. Heh, to be honest, I use that most of the time, it’s one of my favourite ‘stew’ beers Add some ground pepper, salt and the roughly chopped potatoes. Let it come up to boiling again and then turn down to half, so it just keeps on simmering. No need to look after, the tajin drips on the meat and keeps it just right. As you can see I pricked the potatoes and they’re just right As they’re usually the last to be ready, the rest will be good too. Report (21:27): it’s all gone now (just had the last bit as a nibble before bed ) and boy, was it good! Sometimes I amaze myself with my culinairy concoctions Uh-oh, I just realised that that also means I had about 15 prunes… I bet no-one wants reports on that, do they? 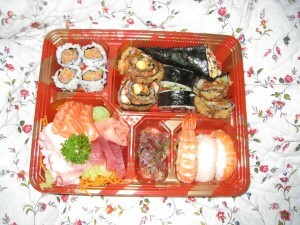 In this photo going around the clock, starting top left: ‘ordinary’ inside-out rolls – crunchy but very nice rolls with a dot of sauce (cocktail???) – enormous cone, had to use hands for that – 2 more ‘ordinary’ rolls, but right side out – also crunchy, tasted a bit different from the other one but couldn’t define difference (egg?) – 3 sushi rice balls, one with salmon, one with white fish, one with prawn – I think tuna in a tangy dressing/marinade – carrot spaghetti I wonder how they got those very long threads – pink ginger flower – green wasabi, nosewatering strong – tuna – salmon – flattened squid tentacle slices, chewy, not much taste . Tomorrow and the day after no post, I’m in London, fetching the girls back – WOOHOOH!! I shouldn’t have complained about the hot weather yesterday Today I woke up with thunder and lightning and the roof being pelted with rain as if a thousand mice were dancing a tarantella on it. Having a modern house with high sloping ceilings is nice, but a pain when trying to sleep when it rains – not as bad as a tin roof, but it comes a close second! 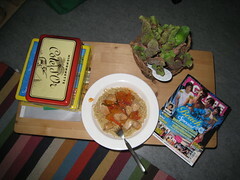 Posted by Rein under Flickr, Home alone, Oki, Soezie and Rooz - the hamsters, What??? Yesterday I had a ‘blah’ day and didn’t post a pic – so I got a worried txt this morning from the girls. When they were re-assured I just had a little ‘dip’, missed them something awful and couldn’t sleep as I was missing their nightly noises but would be there on Saturday morning, bright and bushy-tailed, they were quick to ask for the latest ‘Joepie’ (a teenmagazine that already existed when I was young – now that is a long time ago – not that I bought it, I rather went to the library for ‘proper’ books – I know, I’m a geek and proud of it ). So here is proof I went and bought it and – oh joy – no Tokio Hotel on the cover this time! You know what? I can always squeeze a pic of Oki in from yesterday as #14 – I caught her red-pawed when she was on the table checking out Rooz who came out for a nibble. 13-Hamsters all present and accounted for! Normally I never do the hamsters. 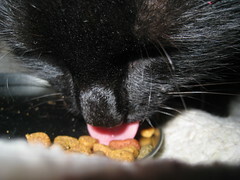 My kids are very good – each looks after their own pet and they’re doing a splendid job. This time though, I have to make sure they’re fed and watered and have a not too smelly house. 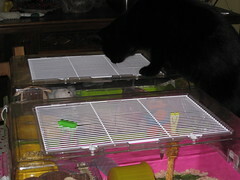 So here’s the proof I’m still performing my duty and both hamsters are safe and sound! I had to chase Oki off the table a few times as she came to investigate, but no animals were harmed during the making of this mosaic! Never realised she’s that dusty! Rein's Cookumentaries and other Stuff is powered by	WordPress 3.3.1 and delivered to you in 0.258 seconds using 41 queries.